A trucking industry-related coalition is engaged in a behind-the-scenes skirmish with two dozen Republican members of Congress over whether the Environmental Protection Agency should be required to conduct a regulatory impact analysis to support the agency’s proposal to repeal an Obama administration rule limiting the manufacture of glider kits. In a May 24 letter signed by 24 GOP members of Congress to Office of Management and Budget Director Mick Mulvaney, the legislators argued that gliders are more fuel efficient, achieve better carbon dioxide emissions than new trucks and are an essential affordable option for many small businesses. The letter also indicated that EPA Administrator Scott Pruitt has said that because glider trucks are not new trucks, the Clean Air Act does not give the agency the authority to regulate them. However, the trucking industry coalition, which ranges from truck manufacturers and suppliers to trucking trade groups, sent emails to a number of congressional staffers urging their members not to sign onto lead author Rep. Bill Posey’s (R-Fla.) letter favoring the glider rule appeal. “The EPA proposal, if finalized, would have broad negative ramifications beyond allowing the sale of glider vehicles, which could undermine hundreds of thousands of jobs and billions of dollars of investment by manufacturers, suppliers, dealers and truck purchasers in the U.S. and jeopardize states’ ability to meet their clean air goals,” the trucking industry group wrote. 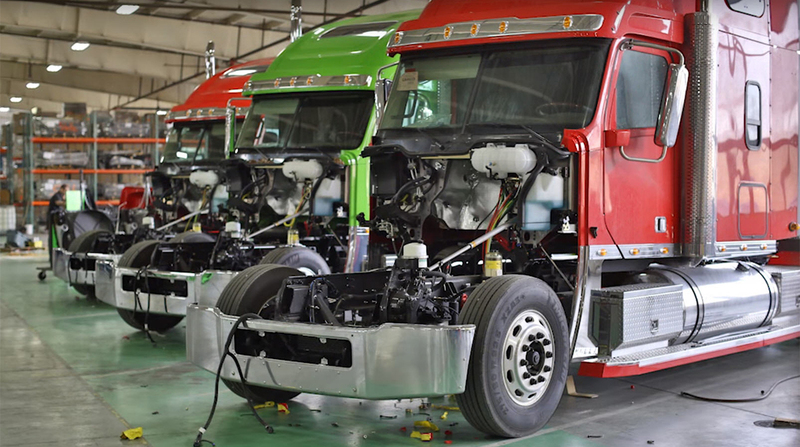 Glider trucks combine new truck bodies with older engines. The glider kits provision, included in EPA’s 2016 Phase 2 heavy-truck greenhouse gas emissions rule, limits the number of non-emissions-compliant gliders built by each company to 300 a year and requires gliders beyond that number be certified as emissions-compliant for the model year they are built. An EPA study made public on Nov. 20, just four days after Pruitt’s repeal proposal was made public, said that emissions from two glider vehicles tested under highway conditions had nitrous oxide emissions 43 times higher than new trucks and particulate matter emissions 55 times higher. The Posey letter said that OMB’s Office of Information and Regulatory Affairs informed EPA that it needs a regulatory impact analysis before the agency can repeal the Obama rule. However, at press time there was no documentation showing that the repeal proposal has been formally received or reviewed by OMB, and attempts to reach a spokesman for Posey were unsuccessful. A regulatory impact analysis is a detailed cost-benefit appraisal of the potential impacts of a new regulation and whether it’s likely to achieve its desired objectives. “It is our understanding the EPA does not need to conduct an RIA for deregulatory issues and taking such a step would delay the regulatory action unnecessarily,” the Posey letter said. To require the assessment “may adversely impact the U.S. economy by $1 billion and jeopardize 22,000 jobs,” the letter said. But members of the trucking coalition argue that a repeal of the rule would unleash pollution from thousands of gliders on U.S. highways causing hundreds of premature deaths each year.